The following essay was read by SCUBA 2014 Artists SuperGroup (Minneapolis) at Velocity’s Artists as Activists: SCUBA Speakeasy (April 24, 2014). Welcome. Our piece is also participatory so if you could stay where you are that would be great. As you can see Erin is following Sam’s movement, Erin is doing her best to follow Sam’s movement, not worrying about doing things right or wrong. I’ll be delivering a lecture on one element of SuperGroup’s practice. While I’m delivering it please do your best to repeat what I’m saying while continuing to follow Sam’s movement. In 2010 SuperGroup premiered Shouldwetitleitnoworwait at the Southern Theater in Minneapolis. Shouldwe… was created by each of the then four members of SuperGroup who each made a forty-minute piece utilizing one performance element (movement, sound, text, and visual design.) These pieces were learned independently and then performed simultaneously, often layering multiple performance states on the site of the body, creating performance worlds of performers moving, speaking, and singing simultaneously in incongruous ways. Performing this piece felt different than any of our prior work. Switching between and enacting multiple states created a hyper-awareness, a constant balance between imaginative states and the task of performing, and an ever-present threat of failure. Performing this kind of multiple-state work also had the effect of removing, as the performer, the burden of interpretation. Because we were combining different tracks we felt there was no way to dictate or even discern an audience’s experience, and so were left with our personal attempts to complete the performative tasks and to stay as present as possible. This work ignited a faith in performance; a newfound liberation from specificity of meaning or transcribing of experience. Through Shouldwetitleitnoworwait and then in several similar projects we became deeply fascinated with the cognitive processes that were occurring while performing. We also began to question how an audience receives this kind of work. What kind of multi-tasking is going on, and how do we react to and embody performance that we can’t fully parse out cognitively? In order to be clearer about what we mean by multi-state performance, we should first get a little clearer about what we mean by performative states. We’re using this term to describe, basically, any sort of altered body and/or mind experience that is explored while performing. States can be emotions like fear, anguish, or joy, or they can be physical states: cold, itchy, compressed, or they can be imaginative states: stone, bubbles, rubber. States also include what could be referred to as characters, and to external influences: imaginary environments with specific rules and mores. Meg Stuart, says that: “the state is a window into a different reality” (137). We like this definition assuming, of course, that every reality is a different reality. States then can range from the neutral posture and everyday tasks of some early Judson Church work to the extravagant, complex, melodramatic characters of opera. In many ways all performance is state based, and in fact we could say that all of life is state based. We are intentionally adopting this vague and amorphous reading of the term to allow a broad range of work to fit within it, acknowledging that some performance creators would recognize something they are consciously exploring, and for others it may just be how they approach performance in general. Many of the ways that people use to describe elements of their own performance practice, such as the acting teacher Sanford Meisner’s “acting is living truthfully under imaginary circumstances” (178) and the experimental choreographer Deborah Hay’s “my body, dancing, is formed and sustained imaginatively” (XXIV) can be viewed as ways to access specific states. We also use the term multi-world performance simply as an extrapolation of state; when multiple performers are in the same state together, or in the case of overarching elements of a production such as scenic décor or music, we adopt the term ‘world’ to get at the shared experience. In our explorations of multi-state performance we could easily identify cognitive ways that an audience processes live performance; the meaning-making and understanding that can be expressed verbally, the characters and narratives that we can talk about, and the sympathetic responses to movement created through shared vocabularies of virtuosity. To examine the ways that an audience is multi-tasking while watching this kind of work we wanted to get a better grasp on the other, non-cognitive, ways that live performance is processed. This led us to look at immediate and unconscious empathetic responses, particularly theories of embodied cognition, kinesthetic empathy, and the mirror neuron system. We don’t have time to go into much detail about these discoveries, but I’d like to touch on them briefly before we discuss how these modes of engagement might be combined in the multi-tasking audience. Kinesthetic empathy, the feeling of being ‘inside’ of a performer’s actions, experiencing their emotional state along with them, grew, in particular, out of the writings of the American dance critic and scholar John Martin, who often used the phrase ‘inner mimicry’ to describe this phenomena. By this he meant that as we view dance “we shall cease to be mere spectators and become participants in the movement that is presented to us, and though to all outward appearances we shall be sitting quietly in our chairs, we shall nevertheless be dancing synthetically with all our musculature” (Martin, 53). Whenever we are looking at someone performing an action, besides the activation of various visual areas, there is a concurrent activation of the motor circuits that are recruited when we ourselves perform that action. Although we do not overtly reproduce the observed action, nevertheless our motor system becomes active as if we were executing that very same action that we are observing. To spell it out in different words, action observation implies action simulation” (37). The implications of mirror neurons on observing dance performance are powerful. As we watch someone else perform an action our bodies receive and process information without conscious cognition. We physically embody other people’s actions as we observe them, engaging our physical bodies as a way to gain a deeper understanding of our viewing experience. Simultaneously, mirror neurons send signals to the emotional centers located in the limbic system of the brain. The neural activity in the limbic system triggered by these signals from mirror neurons allows us to feel the emotions associated with the observed facial expressions – the happiness associated with a smile, the sadness associated with a frown. Only after we feel these emotions internally are we able to explicitly recognize them (112). These ideas become harder to study in relationship to the complex, often ambiguous emotionality of much contemporary dance, but we would argue that these processes are constantly occurring for us as we watch performance. Because “the circuits in modality-specific brain areas are fast, refined, and able to flexibly process a large number of states” (Niedenthal, 1005) we could conceivably be cycling in and out of emotional states with more acuity and speed than we can process and translate into a cognitively cohesive stance. Combined with the idea that as we watch performers with clear intentionality our bodies can predict and adopt the intentions of the performers it is a possibility that those moments of intention allow us to access our personal emotional memories as well, unconsciously processing in our bodies infinitely varied and complex states. These kinesthetic responses to performance point to the complexity of experiences an audience can process. In its immediacy and by bypassing conscious cognition we propose that kinesthetic empathy, embodied cognition, and the mirror neuron system allow an audiences to experience the physical state or states of a performance while simultaneously cognitively processing other information, including text and sympathetic response. When you are in a state of cognitive ease, you are probably in a good mood, like what you see, believe what you hear, trust your intuitions, and feel that the current situation is comfortably familiar. You are also likely to be relatively casual and superficial in your thinking. When you feel strained, you are more likely to be vigilant and suspicious, invest more effort in what you are doing, feel less comfortable, and make very few errors, but you also are less intuitive and less creative than usual (60). While an audience is experiencing multi-state performance, they are continually engaging with their own cognitive strain, processing the material in new and exciting ways. In this kind of work viewers are likely to multi-task between various ways of processing, often noticing their attention shifting between states. Incorporating theories of embodied cognition, however lets us also assume that there is a simultaneous engagement with multi-state material, that as the consciousness recognizes different aspects of the performance the body may be maintaining a continual, empathetic, unconscious engagement. In Sweden they said it was about race riots; in Germany they thought of concentration camps, in London they spoke of bombed cities; in Tokyo they said it was the atom bomb. A lady with us took care of the child who was on the trip. She was the wife of a sea captain and said it looked like a shipwreck to her. Of course, it’s about all of those and not about any of them, because I didn’t have any of those experiences (105). Here Cunningham is describing not only the way audiences generated their own meanings for the work, but also how those meanings became extremely personal. By creating performance combining multiple, separately generated elements the space is opened for audiences to recognize and give validity to their own, highly personal meaning generation. Multi-state performance acknowledges the complex intelligence of an audience. By encouraging an active, multi-tasking viewing experience this kind of work opens a range of modes of engagement, enacting a simultaneity of the conscious and unconscious, empathy and sympathy, the mind and the body, and asks audience to assemble the pieces to make the highly personal whole. Berrol, Cynthia F. “Neuroscience meets dance/movement therapy: Mirror neurons, the therapeutic process and empathy.” The Arts in Psychotherapy 33.4 (2006): 302-315. Print. Cunningham, Merce and Lesschaeve, Jacqueline. The Dancer and the Dance. New York: M. Boyars, 1985. Print. Fogelsanger, Allen and Afanador, Kathleya. “Parameters of Perception: Vision, Audition, and Twentieth-Century Music and Dance.” Congress on Research in Dance 38th Annual Conference. Tempe, Arizona. November 2-5. 2006. Print. Gallese, Vittorio. “The shared manifold hypothesis. From mirror neurons to empathy.” Journal of consciousness studies 8.5-7 (2001): 5-7. Print. Hay, Deborah. my body, the Buddhist. Middleton, Connecticut: Wesleyan University Press, 2000. Print. Iacoboni, Marco. Mirroring people: The new science of how we connect with others. Macmillan, 2009. Print. Martin, John. Introduction to the Dance. IICA, 1986. Print. Meisner, Sanford. On acting. New York: Vintage Books, 1987. Print. Niedenthal, Paula M. “Embodying emotion.” science 316.5827 (2007): 1002-1005. Stuart, Meg. “Dancing States.” Dance. Ed. Andre Lepecki. Cambridge, Massachusetts: The MIT Press, 2012. 136-138. Print. SuperGroup is the Minneapolis based performance collaboration of Erin Search-Wells, Sam Johnson, and Jeffrey Wells. SuperGroup began in the Red Eye Theater’s Works-in-Progress program, 2008 and since has shown work at venues across the Twin Cities including the BLB, the Bedlam Theatre, the Southern Theater, the Casket Arts Building, and the Walker Art Center, as well as at the Bushwick Starr and BAX in Brooklyn. Along with full-length performances, SuperGroup also creates short dances, queer cabaret performances, durational structured improvisations, dance films, and tea parties. In May 2014 the Joyce Theater will present the full-length The Tent Has Been Pulled Down at the Invisible Dog Art Center in NYC. 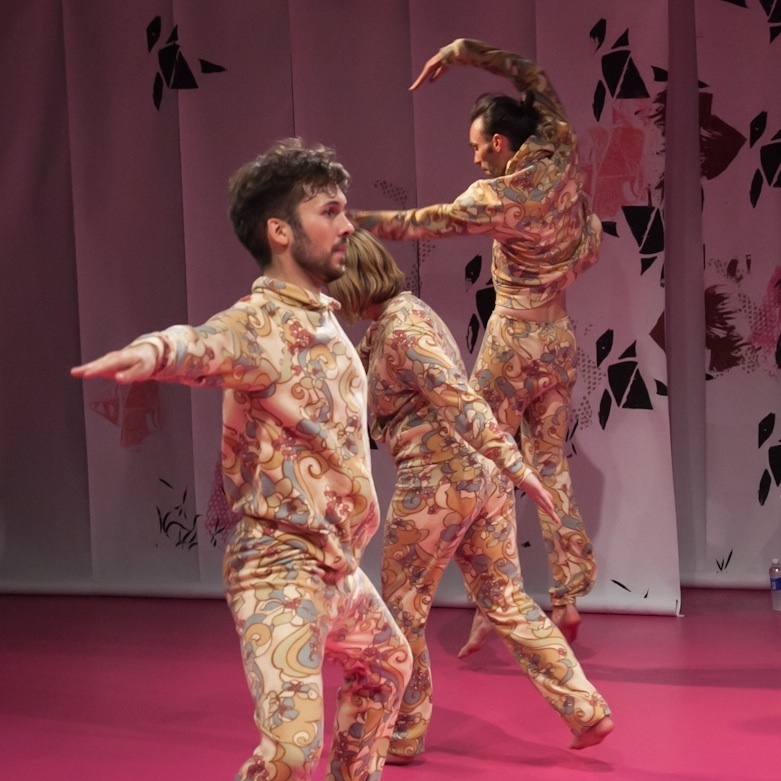 Upcoming projects include a work for Young Dance premiering May 2014 and a collaboration with playwright Rachel Jendrzejewski, art rock band Brute Heart, and installation artist Liz Miller.